We are sure you will be pleased with your purchase from studentcomputers.co.uk. However, unfortunately there may be occasions when you will need to return items to us. If your product is damaged in transit, we ask that you report it to us within 3 working days (24 hours for our business customers). If the items are visibly damaged on receipt, it's best to sign the carrier's delivery note accordingly. Items should be returned in their original packaging complete with all accessories and documentation. Once received back into our warehouse, we'll issue a replacement or full refund to you via your original payment method. If you feel your item is faulty on arrival, we would advise contacting the manufacturer to trouble shoot the issue before organising a return with ourselves. Whilst we are happy to assist with items that fail within the units DOA period, in most cases goods that are at first thought to be faulty actually work. Often instruction books are poorly written or an item is slightly complicated to use, therefore are diagnosed as faulty by the end user incorrectly. Goods returned with no fault found are subject to a handling fee, so we wish to rule out this happening by performing trouble shooting with the manufacturer first. The handling fee can be avoided by running diagnostics with the manufacturer and if a fault is actually confirmed, obtaining the return to vendor authorisation or DOA code. As handling fees are the last thing we want for our customers, the call to the manufacturers technical helpline can often resolve the issue and prevent any unnecessary returns or inconvenience, saving you both time and handling fees for items found to be in full working order. Once the trouble shooting has been completed, if unfortunately a fault is confirmed, please complete our online RMA request form and we will work to resolve the issue for you swiftly. Items should be returned in their original packaging complete with all accessories and documentation. Once we have verified the fault, we'll issue a replacement or full refund to you via your original payment method. If unfortunately your item(s) become faulty outside of the units DOA period, but is still within the warranty period of the unit, the quickest resolution would be to contact the manufacturer directly. On most occasions, they will arrange a collection and repair at no cost to yourself. It can take up to 30 days for the issue with your item to be resolved and the unit returned to yourself, but please be aware it can take longer depending on the manufacturer and the complexity of the problem. If you have purchased an open box or graded item, please complete our online RMA form as the warranty with the item will be fulfilled by ourselves directly. Whilst we are happy to deal with the manufacturer on your behalf, we advise the quickest route for repair is to send it directly to the manufacturer (our designated repair centre) as sending the item to us to deal with the manufacturer does add an additional layer of administration to the repair process and ultimately increases the overall repair time (as worst case scenario, up to 3-5 weeks extra). Our displays adhere to ISO 13406-2. Please click here to see more information. All warranty for Open Box/Graded/Ex Display products is covered under a return to base warranty by studentcomputers.co.uk. Warranty varies depending on grade, please see the product page. You may cancel the contract under the Consumer Contract Regulations by notifying us in writing, no later than 14 calendar days after we deliver the goods that you are cancelling the contract for. You may not cancel your contract with us under the Consumer Contract Regulations where any computer software has been unsealed by you. We will not accept the return of software where the cellophane on software has been opened or software has been installed. Unless the software is part of a package (e.g. the software is included by the manufacturer in the box of a PC and the PC is faulty). The item must not be used and must be 'as new' when returned to us. If the item does not include the original packaging a charge may be made. We reserve the right to make a minimum charge of £50 to restore a used computer back to factory default settings. Please note you cannot return a used computer to us under the Consumer Contract Regulations. Under the Consumer Contract Regulations, you have a statutory duty throughout the period of cancellation, to retain possession of the goods that have been delivered and take reasonable care of them. Please note: Consumer Contract Regulations do not apply to businesses or Trade sales. You can request a return using our easy to use, online returns system which can be accessed here. Original packaging is usually designed to ship the product once, not multiple times. Reuse can weaken the packaging and place the inside product at risk. 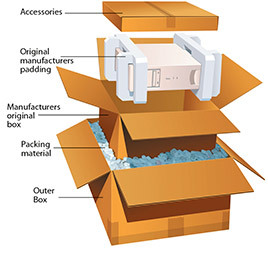 Overboxing provides extra integrity for the weakened original manufacturer’s packaging. Inspect the original packaging to ensure that the cushioning material and box are intact and unbroken. Make any repairs with pressure-sensitive adhesive plastic tape that is at least 2” wide. Pack the product using all the original packaging components. Place outer carton into a black polythene bag so as to conceal the identity of the item you are returning, and place shipping label on the outside of this bag once taped up securely. Shipping without original Manufacturer’s Packaging. 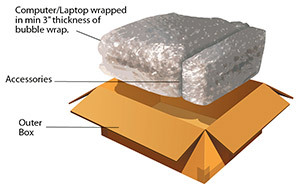 Wrap the computer or peripheral with at least 3” to 4” of air-cellular cushioning material such as bubble wrap. Place the wrapped item inside a sturdy outer box. Accessories that are wrapped in appropriate amounts of cushioning can also be placed in any open spaces of the box. Fill all spaces with additional cushioning so that the wrapped item fits tightly inside the box. Close and seal both the top and bottom of the box with 3 strips of pressure-sensitive plastic tape that is at least 2” wide. Tape all seams or flaps. Click here if you would like to use our online returns system.